Samsung has now confirmed the date of the Samsung Galaxy A8s smartphone launch. The Samsung A8s is set to launch in China on December 10 with a new display and front camera design. 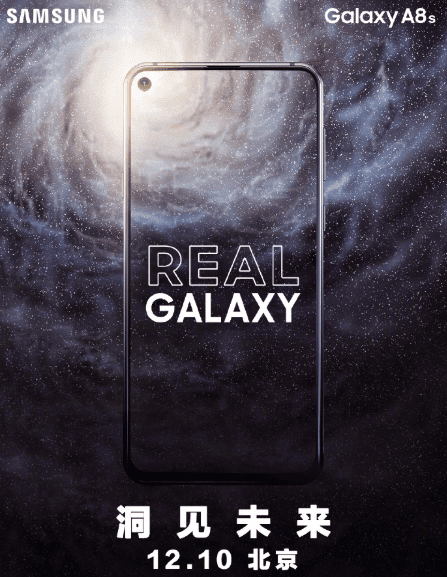 The Samsung Galaxy A8s has a similar display and front camera design that is found on the Huawei Nova 4 that will launch on December 17. The Samsung Galaxy A8s will be launched a week before the launch of the Huawei Nova 4 with similar selfie camera placement. If that's the case, Samsung will be the first smartphone maker in the world to launch a smartphone with the said new screen technology. It seems like Samsung was waiting for Huawei to announce its launch date, for it to then decide its launch event date for a week earlier. Looks like this is a start of a new display trend that aims to eliminate the notch design. Specs are still unavailable but based on previous leaks, the Samsung Galaxy A8s romured to debut with a 6.3-inch display with a full-HD resolution and and 19.5:9 aspect ratio. It is also said to have a Qualcomm Snapdragon 710 chipset paired with 6GB of LPDDR4 RAM and 128GB internal storage that is expandable via microSD card (up to 512GB). In the camera department, the Samsung Galaxy A8s is rumoured to bear 24-megapixel, 5-megapixel, and 10-megapixel sensors at the back. At the front, there is a 24-megapixel sensor that will be placed in a display hole. The size of the hole is said to be 6.7mm. In terms of dimensions, the smartphone measures 159.11x74.88x7.38mm. The Galaxy A8s will have a full-screen display without a notch. The bezels on the top, chin, and sides will be very small as well. There will be a hole in the upper left part of the phone to house the selfie camera. It will come with ultra-high screen-to-body ratio. Based on reports, the Galaxy A8s will feature a 6.39-inch screen with 19:5:9 screen aspect ratio, Snapdragon 710 SoC, 6GB RAM, 128GB storage, 3,400mAh battery with USB-C charging, and a 24MP + 10MP + 5MP triple-camera setup at the back. We’ll know more once the device is officially unveiled on December 10, 2018.